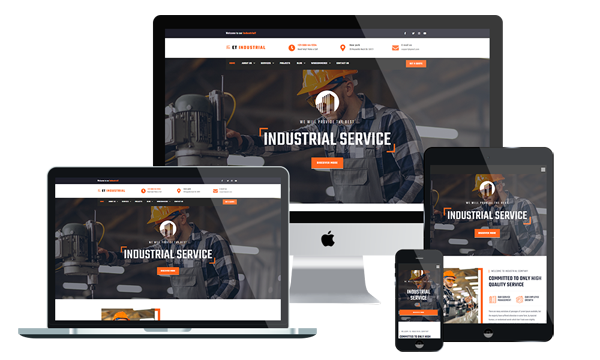 ET Industrial is Responsive Joomla! template that targets for industrial companies. Industrial Joomla! template builds with latest Bootstrap CSS Framework, Support Font Awesome and K2 extended style. Each industry website template is fully responsive and allows cross-browser compatibility so users can access your page from various browsers and devices. It comes with flexible homepage which drag-drop layout and full-width layout, strong shortcodes, unlimited module position, and has drag-drop tools and color settings helping to create unique websites with various layouts. Besides, Industrial Joomla! template is also included 4 color schemes and boxed layout to make your template look more motivated and attractive. High-quality images and an interesting color scheme are put together to create professional and clean designs for your industrial companies. Industrial Joomla! template is highly customizable and flexible in order to make sure they will fit your business and vision the best. The customization process is done using the back panel interface where you can change things like the color scheme, content categories, main slider images, gallery script slide (you can choose out of options like Accordion, Gallery, and Slider), adding or removing specific modules, etc.